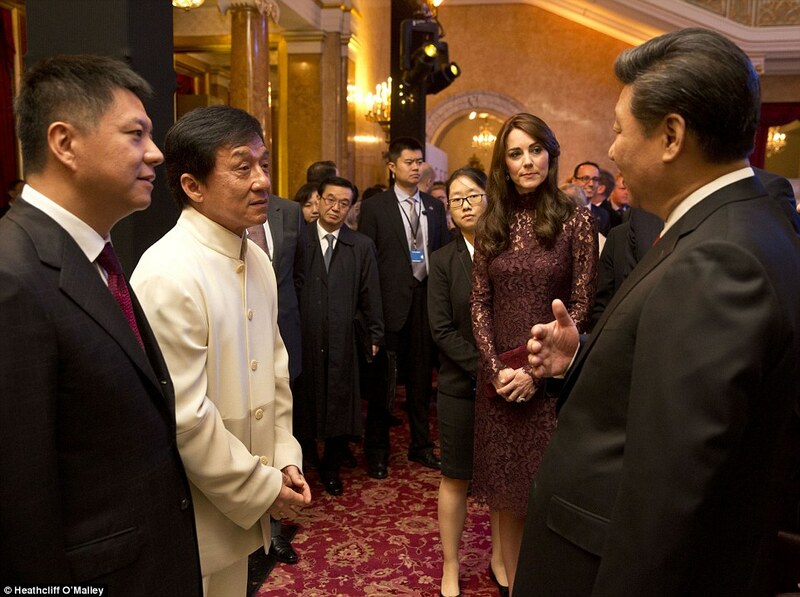 Stealing the show in a plum-coloured lace dress, Kate looked relaxed as she greeted First Lady Peng Liyuan, a style icon in her own right, outside Lancaster House, in London, where the group attended the showcase highlighting the creative and technological collaborations between their nations. The best of British was put on display at the event, including an outlandish hat by leading British milliner Philip Treacy, a Dalek and Tardis from Doctor Who, and James Bond's Aston Martin. The guests were also treated to a live performance by some of the cast from the hit BBC show Poldark. 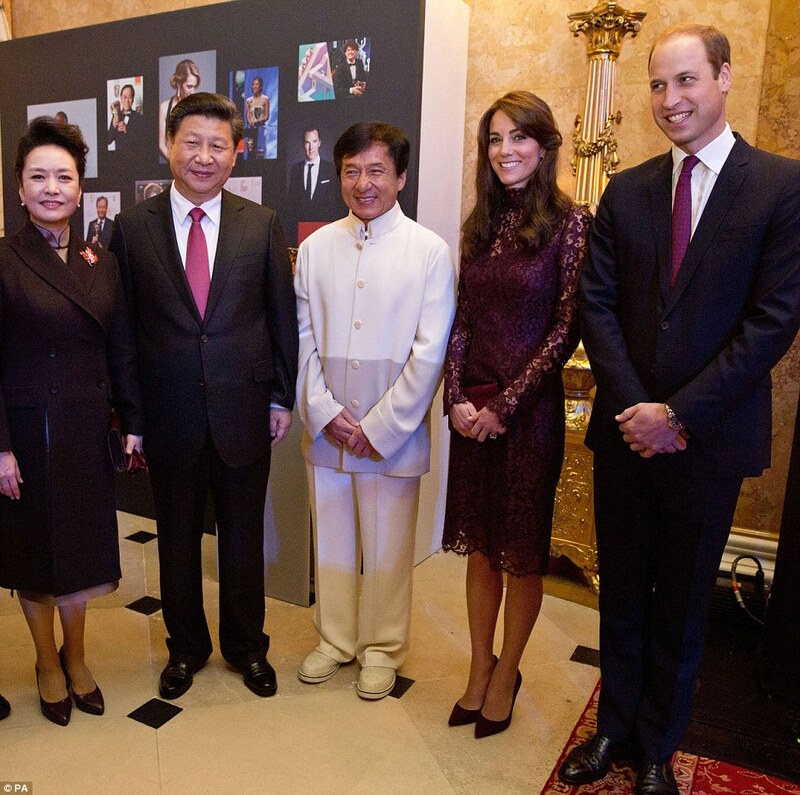 There was excitement when Chan met the royal couple, with both William and Kate smiling as they posed for a photo alongside their guests. This afternoon, Mr Xi joined the Prime Minister at Downing Street for a working lunch and talks with Cabinet ministers. The Government hopes this week’s state visit will secure more than £30 billion of trade deals, including huge investments in infrastructure projects. Tonight the visiting dignitaries attended a banquet at Guildhall, hosted by the Lord Mayor and the City of London. Day two of the four-day state visit started with a visit to Imperial College London with the Duke of York and Chancellor George Osborne. The university is China's leading research partner in Britain. Today it announced a raft of new initiatives that will further strengthen their ties. During the visit, Madame Peng was presented with a cape which was designed through a computer analysis of 700 photographs of her. It was followed by the event at Lancaster House, which showcased some of the creative collaborations between China and Britain. The VIP guests met with British TV, film and theatre actors, taking in exhibitions and demonstrations by BBC Earth, Sherlock, and the Society of London Theatre. The group were given a sneak preview of a crucial scene from the next series of the hit show Poldark. They watched intently as Heida Reed, who plays Elizabeth, and Jack Farthing, who portrays Poldark's nemesis George, both dressed in period costume, argued about marriage. Prince William asked the actors whether it was windy filming in Cornwall, before talking about his own family holidays in the region. They were also seen viewing iconic props from British TV, including a Tardis and Dalek from Doctor Who. The Duke and Duchess of Cambridge later posed for a photo alongside Mr Xi, Madame Peng and Jackie Chan - who happily posed for selfies with other guests.